In today's society, shoes and footwear are an important part of fashion and can complete a perfect outfit. For some people however, problems with shoes, fitting and sizes can cause problems, preventing the enjoyment of many styles of shoes and limiting choice.These problems can occur for many reasons, usually due to design issues of the shoes, or because of physical or anatomical problems of the person. Why do Shoes Sometimes Feel Uncomfortable? Most of us are aware that many adults have feet that are different in size. Manufacturers seem slow in addressing this problem as most do not allow people to purchase a matching pair of shoes in different sizes, tailoring the shoes to the individual. Other problems may be because of the person and any medical complaints that might affect the shoes from fitting correctly.Bunions are a particularly good example of why shoes might not fit comfortably.As the bunion develops the position of the toes changes, pressure can build-up in the foot and the bunion can appear more pronounced, deeming many types of shoes un-wearable.Corns, calluses and verrucas can also contribute to show fitting problems as the pain and discomfort, or even the pads used to treat the problems and relieve pressure, can decrease the choice of shoes, and make the remainder more difficult to select and gain comfort from.Those who have had surgery of the foot, ankle or lower leg may find that they can no longer find comfort in shoes that they used to and will be prevented from having as much choice in footwear. Some people may simply have feet that are slightly unique in shape and find that most shoes are made to fit feet without problems such as being particularly narrow, wide or even a mixture of both such as wide at the toes and narrow at the heel. The most obvious answer to try and overcome any of the issues surrounding footwear fitting, is to find a company that will allow the shoes to be more tailored to the individual.For those with foot ailments, it is important to get these treated either by a doctor, chiropodist or by using at home methods. Pads, insoles and lotions should be used if necessary and further occurrences prevented when possible. 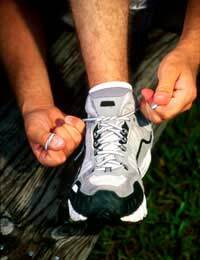 Those people who have problems because of the shape of their foot may benefit from wearing lace up shoes that can be laced in a variety of different ways to try and counter the problem.Essentially, it is important not to try and force feet in to shoes that do not fit properly, are uncomfortable or have been worn in by someone else.Many of the common foot problems are caused by wearing inappropriate footwear; this is especially true of women who wear very high heels often forcing bones and tissues to become irregular. Foot pain and discomfort can cause many people a lot of misery due to the function of the feet. It is important to try and prevent any conditions from occurring, and to treat those that do.For those who have many problems finding shoes that a re comfortable, it is advised they do a lot of research until a company can be found that allows the shoes to be fitted or altered to fit the individual.